One of the main references to the food of the immortals can be found in Greek mythology. It is written in the stories of the Greek gods that ambrosia and nectar was the food and drink of the immortal gods and this first appears in the Greek mythology relating to the birth of Zeus. Before the ‘invention’ or ‘discovery’ of ambrosia and nectar by the gods, it was written that they would feed by ‘sniffing’ the vapours of their dead enemies, as if they would feed from the energy of the dead souls. Ambrosia was said to come from the horn of a magical goat named Amalthea, the foster-mother of Zeus. The horns of Amalthea provided a limitless supply of ambrosia but were also capable of producing any kind of food for any kind of living being. White holy doves would carry the ambrosia and a large eagle with shiny wings would fly at an extraordinary speed through the sky where he would get the nectar and then bring it down to the baby Zeus. When demigod Achilles was born, his mother would pour ambrosia over Achilles and he would become immortal, but because she held him around his heel that was the only part that remained mortal. This allowed Achilles to be killed later on by Paris. It was said that ambrosia was used by the gods to cure diseases, fix scars, and make the body beautiful again. If dead people would be treated with ambrosia, their bodies would remain in perfect condition forever. In other references, we can see that ambrosia was abundant in the gardens of Hesperides. 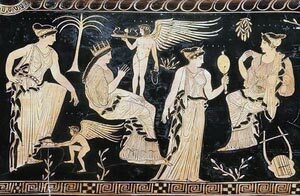 Hesperides were nymphs who tend to a blissful garden in the far western corner of the world, a place where ambrosia was brought to the God Zeus. When Adam and Eve ate from the forbidden Tree of Knowledge, it appears that God alerted other Gods to be on alert because man should not eat also from the Tree of Life and become immortal like them. Moving on to Zoroastrian and Vedic mythologies, we can see reference to a special drink consumed by the gods, known as Soma and Haoma respectively. This special drink was prepared by extracting the juices from the stalks of certain plants, which are unknown to us today. Drinking Soma and Haoma would give immortality. 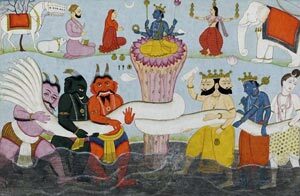 Idra, the leader of the Devas, and the God Agni, are mentioned in the Rig Veda to have been drinking large quantities of the immortal drink. If we now move to Egyptian mythology and the legends of Thoth and Hermes Trismegistus, we will see that there are references to both of them drinking ‘white drops’, also referred to as ‘liquid gold’, which provided them with immortality. References about this can be found in the Quran (Sura 18; the Khidr) and in one of the Nag Hammadi texts. In Sumerian texts, we have references to the Ninhursag’s milk, one of the seven great deities of Sumer, the goddess of fertility that is associated with a cow (similar to the magic goat Amalthea of the Greek mythology). The gods and the kings of ancient Sumer would drink from this milk to become strong and immortal. In the Epic of Gilgamesh, we also have reference to a thorny plant at the bottom of the ocean that would make someone immortal and this was kept as a secret of the gods. In the Hindu religion, the gods would harness a milk called Amrita, a nectar that was collected and drunk by the gods to give them immortality, but forbidden for humans to drink. This milk was apparently surrounding the Earth, and the gods would collect it with the help of a serpent. In Chinese mythology we have the ‘Peaches of Immortality’ as the food of the immortals. Eating this food ensured the everlasting existence of the gods. If humans would eat from this fruit they would also become immortals. The search for the Elixir of Life has been the supreme quest for many. In medieval times, there are accounts of the alchemists looking for the philosopher’s stone, believed to be required to create the elixir but also to convert lead to gold. 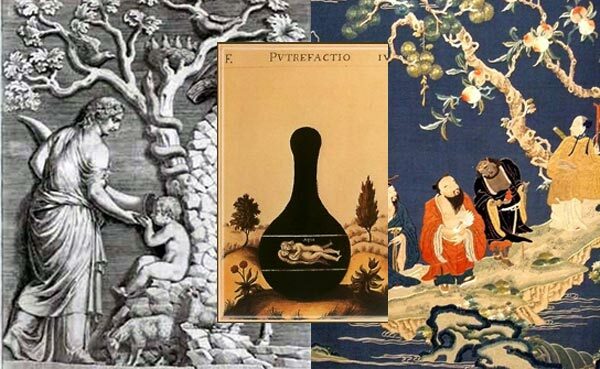 Bernard Trevisan, an alchemist of the 15 th century said that dropping the philosopher’s stone into mercurial water would create the elixir, and we have multiple cases of alchemists that allegedly found the Elixir of Life including the infamous Cagliostro or Saint Germain. I think if you read the whole story in Genesis that Adam and Eve were forbidden from eating from the Tree of Knowledge of Good and Evil. Not the Tree of Life. Yes, both trees were in the center of the Garden of Eden. But only one was forbidden. Note also that it is not the Tree of Knowledge in general, bu the Tree of Knowledge of Good and Evil that was forbidden. Why do we always get this mixed up? It makes a huge difference. The garden was closed to Adam and Eve after they had eaten of the Tree of Knowledge of Good and Evil so that NOW they wouldn't be able to also have eternal life. What if they had eaten of the Tree of Life and left the Tree of Knowledge of Good and Evil alone? Addionally, many people call the Tree of Knowledge of Good and Evil, the Tree of Judgement.